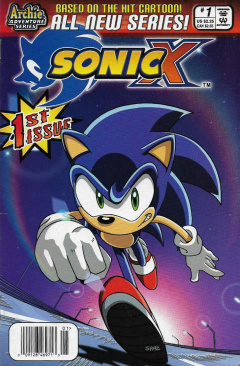 Sonic X #1 is the first issue of the Sonic X comic series published by Archie Comics. It has one story, Savings and Groan. The story begins with Sonic and Sam Speed in the middle of a race, with Sonic and Sam neck-and-neck with each other. Sonic wishes he had a ring, but thinks Amy would get mad at him for cheating. Ironically, Amy is trying to get Tails to throw Sonic a ring at that very moment. Although it looks like Sam might actually win for once, Sonic easily catches up and beats him. Sonics friends cheer for him, while Sams team tries to cheer him up for losing again to Sonic. Meanwhile, Eggman is having a tantrum of his own, as nobody will give him the supplies he needs to build his robots. Eggman says that he has been studying the inhabitants of the planet, and discovered that they exchange pieces of paper for goods and services. He then sends Decoe and Bocoe down to an ATM machine to try and see if they can get money, but they get arrested for trying to break open the machine. This page was last edited on 18 March 2019, at 23:17.